This February, Bev Boss died. She was an early childhood educator of many years and great influence. Boss was a champion of play-based education and she was a gifted musician, singer and songwriter. The early childhood field will miss her fearless voice. Among the many tributes paid to her was the following, written by Tom Rotelli, a parent at her school. I include this excerpt here as a vivid picture of what a preschool environment should look and sound like. For the most part, in our country, at this moment, it does not. We all need to be “the gardeners” who keep nurturing what we know is good for children. On February 4, 2016, Bev died. By her standards, it was an unimportant day, because on that day she did not arrive at the school an hour before the first child, she did not sweep what she had swept so often, she did not say, “I was waiting for you,” she was not hugged by a child, she did not hand out paint nor melted crayons nor glue nor dye nor vinegar nor baking soda, she did not shoo away a bunch of parents for clumping and not watching the kids, she did not try to push a swinging child all the way around, she did not bury a dead walking stick nor a fish, she did not argue with the state as to why a preschool should not have an open body of water in its entryway nor why a roaring fire in the sand yard was unusual, she did not read a book, she did not laugh at Teacher Sally so bundled in Surveyors Tape that she could not walk, she did not look at a child covered head-to-toe in shaving cream and say, “Let me get you more,’ she did not ask Michael Leeman to sing 47 verses of On The Day I Went to Sea, she did not pinch a parent for saying “Good Job!” Her auto-harp was still. She did not say, I love you. February 4, 2016, however, became perhaps the most important day in all of our lives. For on that day, we inherited something … something wonderful … something awesome … something scary. On that day, WE became Bev’s legacy. The burden that Bev had always carried for us suddenly passed to us. We became the gardeners. Our love demands that we rise to become the champions that Bev showed us how to be. We must stick up for childhood. We must challenge the norms. We must never rush a child. (As her great friend Docia Zavitkovsky said, “Pulling the tail off a tadpole will not make it a frog!” ) We must discard the word “readiness:” and ask not if the child is ready for kindergarten, but is the child done with preschool. We must not praise art. We must never do for a child what she can do for herself. and we are the gardeners. 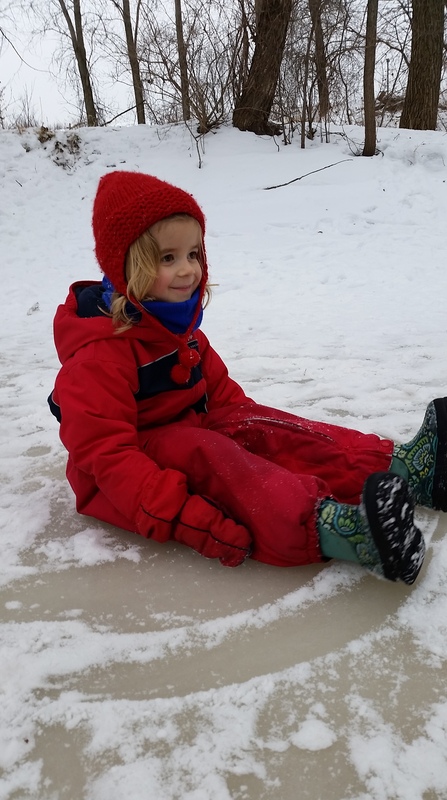 By late January, we finally had enough snow to construct a winter favorite: a quinzhee! 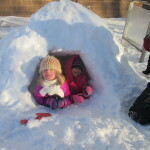 A quinzhee is a snow shelter, or snow cave. These were originally built by the Athapaskan Indians in Canada for emergency shelters. We, of course, build them for fun. A true quinzhee is a hollowed out cave, similar in shape to an igloo. We add the fun of a tunnel to our quinzhee and build it on a small incline so kids can SLIDE through! 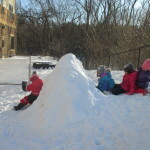 The preschoolers started our quinzhee by making a huge pile of fluffy white snow. 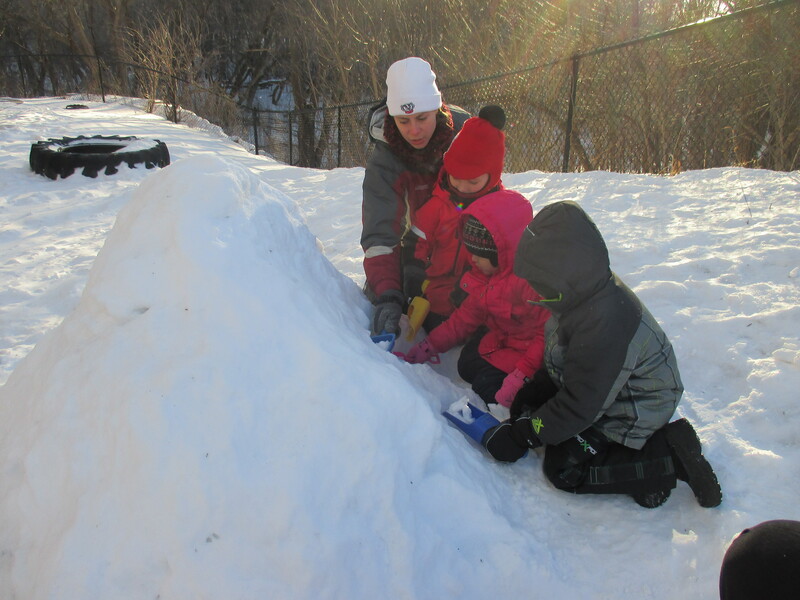 We used large snow shovels, small hand shovels, and even sleds to scoop and haul the snow until the pile was as tall as the teachers! The children were motivated to build the highest pile they could. A few children recalled a quinzhee we built in the past and their excitement inspired the rest of the group. 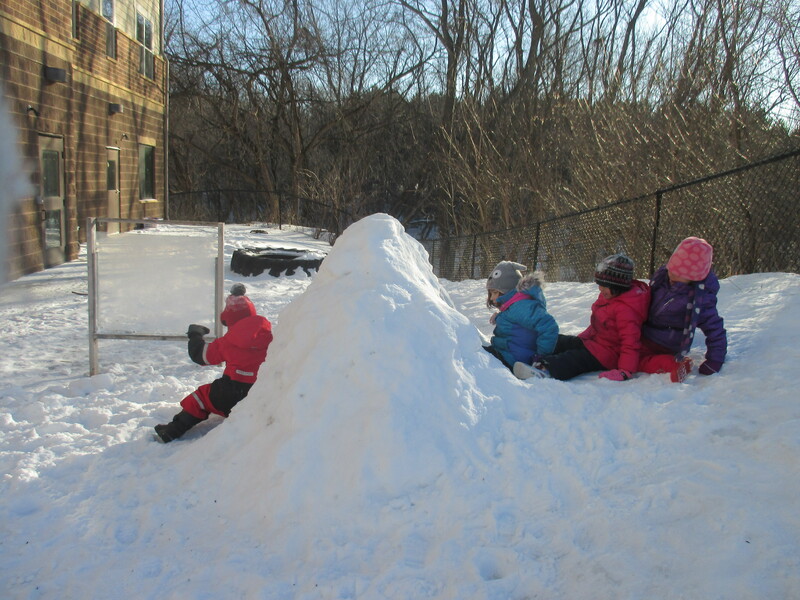 It took nearly an hour of the entire class working together to build the original snow pile. 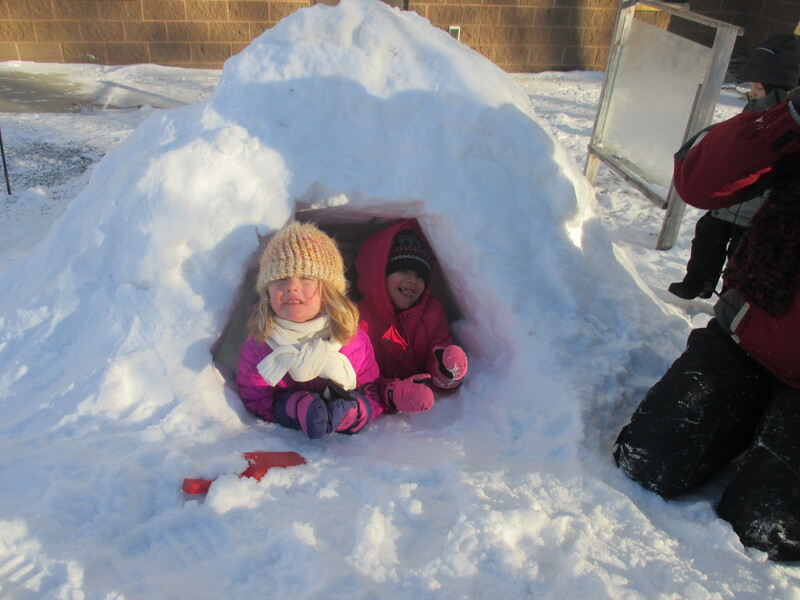 Some students dug and scooped while others packed the snow together. Then we took advantage of a physical change in the snow called sintering. Sintering is the bonding of snow crystals of different temperatures. We piled the snow on a warm morning, knowing the temperature was going to rise. This helped the snow pack together, and that night when the temperature dropped below freezing, the snow solidified into a sturdy structure. Our next step was to dig out a tunnel. Directed by the teachers, children worked from both ends of the tunnel to dig towards each other. A few students discovered they could move more snow by kicking the snow than by digging with their arms. When the first kick burst through to the other side and all we could see was a boot, a great cheer erupted from the tunnel makers – this was the moment we had all been waiting for! There was some discussion about how to move the ice that was currently on the sidewalk up and under the quinzhee. Right away one student argued that we would not be able to get the ice off the sidewalk. Some tried, but the ice broke into small pieces when pounded. The same child who argued against the sidewalk ice said that we needed to freeze water to make ice. A fire brigade was formed from the classroom sink to outside. Several buckets of water were moved outside, but the group was unsure of how to get the water in the right spot. Their first attempt to pour water in the tunnel melted the snow down to the grass. The next pour at the bottom of the tunnel made a giant puddle, but all could see that it would not help our goal of a slippery slide. Finally, from the wondering of a teacher (“I wonder where the best place to start sliding through our quinzhee would be?”) a student thought to tip a bucket of water down the hill and watched it trickle through the quinzhee. Several followed suit, starting their water close to the tunnel entrance.The teacher did have to convince the slide builders that the water needed time to freeze, and the group reluctantly agreed to wait until the next day to try their creation. It was worth it, as our perfectly slippery slide provided the whooshes and speedy ride all were seeking. Projects like building the quinzhee are fun, but just as important is the experience of delayed gratification. 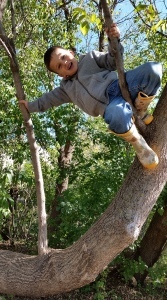 Waiting for fun things is difficult, but having a project that could not be completed in one outdoor time gave the children, over time, a goal to work toward. In addition, they found that one preschooler was not capable of creating a quinzhee on their own. Teamwork, another important life skill, is necessary. 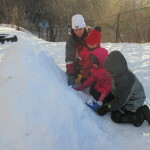 An exciting icy slide through a snow tunnel that everyone worked together to build was an incredible reward. We slid through our quinzhee many times for many days. Then alas, the temperature warmed and we got rain instead of more snow. “It’s shrinking!” children said. We also observed over several days other creatures enjoying our quinzhee- we watched birds and squirrels chewing on our quinzhee from the Autumn Room windows. “They’re eating our quinzhee!” the children exclaimed. “Why would they do that?” wondered a little girl. It wasn’t long before we solved the mystery- one day several of us watched a squirrel dig through the snowy walls until it came out with birdseed clutched in its paws. When we scooped the snow to build our structure, we must have gotten some seed-laden snow! Now we can see several small tunnels the animals have dug in pursuit of birdseed! Oh well, the more the merrier! 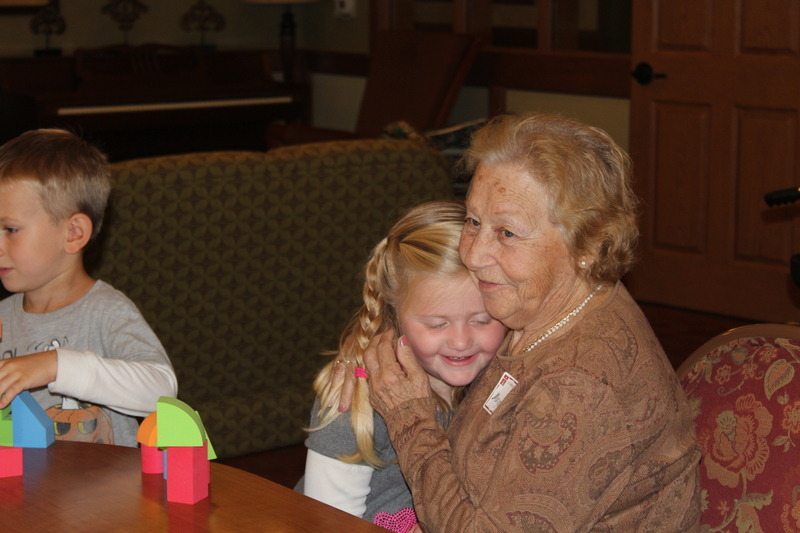 Teachers have countless touching and humorous stories about the connections between the preschoolers and the residents at Inver Glen. We work to instill respect, acknowledgement and patience. One of our roles is to put preschoolers on a path that crisscrosses often with the grandmas and grandpas because we know connection occurs most often between the lines, in the small moments that are easily rushed past. We nurture those moments until they become second nature and they show up often in shared greetings, conversation, touch, gift giving and play. I asked parents to share stories about these moments. Were they being talked about at home? Robyn Hannan, mother of three-year-old Isaac, wrote of his deepening bond with the residents. Isaac doesn’t usually give specifics about his interactions upstairs, but what I have noticed is that he is much more connected to the upstairs neighbors this year than in the previous two. He loved visits from the grandmas during Toddler Time, but the relationships have deepened this year. He’ll tell me about how the grandmas and grandpas get involved in the imaginative play regarding pirates or watch while the kids play outside. You can almost watch his circle of care get bigger as he talks-and it works both ways. He can tell they care about him, and you can see he cares about them, not just in his stories but in how he remembers (most of the time) to walk quietly in the hall since the “grandmas and grandpas might be sleeping.” As a mom, to me the greatest thing is that Isaac gets this time at such a young age with a population we rarely give a voice to in our society. I know those relationships will be recalled fondly as he gets older. Natalie Mulrooney, mother of three-year-old Annemarie, spoke about her close relationship with one resident in particular. Eydie Nelson, found joy in her 4-year-old son’s connection with Grandma Bette. I simply love how Myles thinks of Grandma Bette as his grandma. I just love this. So sweet. What about beyond the classroom mores and expectations? Are the connections we nurture showing up outside of the school setting? Natalie Mulrooney shared one such story about her daughter’s comfort connecting with seniors outside of school. Annemarie often walks up to seniors while we are out and engages in conversation with them. On one occasion we were at Walgreens and she walked up to a woman with a walker and touched her hand and smiled. I forgot what she asked her but they engaged in about a three-minute conversation and by the end the woman was beaming. I know that she does this because she has so much practice at school! She shared a story of her toddler son’s encounter with a grandpa while picking his sister up from preschool. Becca Goodpaster, mother to 5-year-old Ambrose, wrote a poignant reflection on just how large an impact fostering a relationship can have. Hippocrates compared life to seasons and old age to winter. Winter is quickly becoming our family’s favorite season. Though many see winter as a time of inconvenience, darkness and cold, we see it as a time to slow down, reflect, and seek beauty. In an age in which popular culture values youth, our family feels we’ve neglected the wisdom and appeal of our elders. Books, TV shows, and talk with friends often portray the youth as progressive, winsome, and intelligent, and parents, grandparents or anyone older as nitwits. We chose to send Ambrose to preschool at All Seasons with several goals in mind, but the greatest pursuit of ours was to get to know the seniors. To love them and show them value and relevance to our lives. This goal was met with enthusiasm when Ambrose took an immediate liking to his classroom reader–Grandma Bette. He would ask to go and visit her. He would make her many creations at home and involve her in his play. She is not just someone he sees at school–she is a friend to him. Ambrose easily opened the door for us to pursue a relationship with Bette. Our friendship with Grandma Bette has shown us that indeed winter is the most beautiful of seasons. She has faced many trials in the past several years and still exudes positivity, peace and joy. She understands something I have yet to learn, and I desire to glean much more wisdom from her as we continue to visit her.